Since digestive health plays such an important role in our horses’ health and happiness, and since we’ve focused so much on ulcers recently, in this article I’m offering a highly educational article by Gillian Clissold on beneficial properties of papaya on digestion. Enjoy! Papaya aids digestion in part by increasing mucous secretion in the mouth, esophagus and stomach. In some cases, a horse that had been turning its nose up at food starts eating within moments of the administration of papaya. There seems to be what could be called a “reverse Pavlovian response”. The horse’s mouth waters, so it feels the urge to eat. Even more importantly, papaya initiates a thickening of the horse’s natural stomach lining which provides protection against excess acid. It both gives damaged tissues a chance to heal, and helps prevent new ulcers. In horses moving vigorously (race horses, eventers, endurance horses) the esophageal mucous protection can help keep reflux from damaging the esophagus. In an ulcer study published in the March 2005 issue of The Horse Journal, “rapid relief within three to five days” was reported. The same study reported that the other major natural products for digestive problems, herbal blends, worked considerably more slowly. In one case a weanling with severe ulcers and a bloated stomach did not respond to expensive pharmaceuticals but did recover to papaya. A race horse that had such severe ulcers it could not race, even after many weeks on an acid reducing pharmaceutical, had a clear endoscopic exam after three weeks on papaya, and then won a stakes race. Unlike most of the conventional anti-ulcer treatments, papaya is safe for long-term use. The calcium/magnesium antacid type products work by neutralizing acid and coating the stomach wall with a chalky protective layer. However, if they are used over an extended period, resulting high levels of magnesium can interfere with the absorption of calcium. Low calcium levels can cause nervousness, bone changes, weak and aching muscles and abnormal heart rhythms. The expensive pharmaceuticals which reduce acid production are great for most acute ulcer symptoms. However, acid is needed to control and modify bacteria in the gut. If the acid levels are low for many months, “bad” bacteria, particularly Salmonella, can overpopulate the digestive tract and create conditions for colic. Furthermore, prolonged low acid levels can cause poor absorption of vitamin B12, inefficient utilization of dietary protein, food allergies, bloating and foul manure. Papaya is also useful in conjunction with administration of certain medicines. Many barn managers “prep” the horse with a half dose of papaya to trigger extra mucous in the digestive tract lining just before they administer an anti-inflammatory capable of damaging the stomach lining. They then administer the anti-inflammatory, and follow up with another half dose of papaya to wash away the foul taste of the medicine. Similarly, endurance riders and eventers who give electrolytes to their mounts mix the powder with papaya before administering. The extra mucous triggered by the papaya protects the mouth, esophagus and stomach from the caustic burn of frequent electrolyte administrations. The mucous producing characteristic of papaya is complemented by the enzyme it contains, papain. Papain is the main active ingredient in meat tenderizer. It closely resembles the digestive enzyme pepsin. Old horses benefit from papaya because its enzyme breaks down what their less efficient digestive tract can’t and they gain weight. Papaya also helps foals who get “scours” when the hormones in their mother’s milk changes during the first heat presents the foal’s digestive tract with a new challenge, for which it does not have the appropriate microbe population. The papain enzyme picks up where the foal’s own system is insufficient. Weaning is a stressful time, too. Not only are foals anxious (creating conditions for an ulcer), but they must deal with a change in diet, for which they may not have the correct balance of gut “bugs”. In addition to the papaya induced ulcer-preventative mucous secretion, the papain helps weanlings digest new diets while their gut microbes are adjusting. Similarly, when antibiotics kill good gut bacteria, leaving the digestive tract unable to sufficiently break down food, diarrhea results. Papaya picks up where the bacteria leave off, and antibiotic-induced diarrhea can improve. When horses get diarrhea during trailering, it can in part be due to anxiety-induced changes in gut motility not allowing absorption. The papain enzyme helps break down the food in the limited time it is in the gut and may reduce the diarrhea. A final important characteristic of papaya is its taste and consistency. It has the viscosity of tomato ketchup, and is extremely sweet. This makes it ideal for camouflaging unpleasant medicines. One racehorse trainer wasted several hundred dollars of expensive antibiotics, which his horse spit out on the walls, before he realized that the horse would happily swallow the dose if it were mixed with papaya. Horses who need extra salt in hot weather, but refuse it in their food, lap it up if it’s mixed in papaya. Papaya apparently tasted so good to one horse that he grabbed a bottle left close to his stall, chewed off the cap and licked up the resulting spill. Another owner found that if he approached the fence with a dosing syringe full of the fruit, his horse would immediately gallop over. Papaya is also a mild “blood thinner”. The increased circulation associated with the slight anticoagulant effect may account for the very shiny coats and high incidence of dapples that many horses on papaya enjoy. Some caretakers also report an improvement in joint health as well. Papaya should not be administered to a horse that is on an anticoagulant already, as there may be an additive affect. Some stages of pregnancy can be complicated by bleeding, so it is unwise to administer papaya to a mare who is pregnant or who is about to be bred. 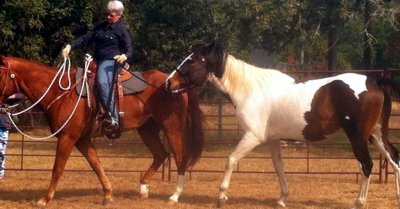 Finally, some papaya-fed horses become quieter and accept training more readily. Papaya contains no tranquilizer, so it must be that a horse with a more comfortable digestive tract is happier. In 1999 I purchased a 9 year old 15 hand 2 inch low level eventing mare of indeterminate breeding as a resale project. She had been rescued from a slaughter truck as a yearling, and despite good training and a caring owner, she had become so spooky and unpredictable she was no longer a good match for her rider. When she arrived at my barn, she was underweight, had a surly attitude, poor appetite, and dumped me at least once a week with massive spooks. She was reluctant to “go round” and while she had a spectacular jump, she rushed quite badly. She had done Novice level eventing and I hoped to bring her up to Preliminary and re-sell her. While training and resolution of hitherto undiagnosed Lyme disease improved her health and behavior considerably, it was only when we recognized and addressed her ulcers that she truly came into her own. She was already being managed in a holistic manner, and she was competing infrequently, so we obviously had to add an ulcer remedy. My holistic veterinarian suggested I use fresh papaya, which immediately increased her appetite and, most noticeably, changed the look in her eye. She no longer looked grumpy when being tacked up, her appetite increased and I was able to reduce her grain meals by ½ and still keep her weight up. Her spookiness was much reduced, her rushing became manageable, and while her dressage was never spectacular, she stopped having heart attacks about the judge and the flowers, and concentrated on her job. Eventually I was unable to find a regular affordable supply of fresh papaya. I discovered the Healthmate company via the internet and began to buy their purees, concentrated papaya product by the case. Despite the fact that she is built downhill and looks as if she should be herding cows, and that I had never gone higher than Preliminary and was in my mid 40s, Sport and I started to move up the eventing levels, and I decided to sell a different horse and keep her. In 2003, when she was 13 and I was 47, we astonished ourselves by moving up to Advanced. We had a spectacularly successful year and her ulcers stayed in abeyance despite trailer rides of 16 hours and intense galloping to get her fit. She crowned her year by being the 2003 US Eventing Association Mare of the Year. In December of that year, just as I was contemplating accepting one of the large offers I had received for her to pay off the unmanageable debts accumulated from the intense competition year, Healthmate decided to sponsor us and begin to nationally market their Stomach Soother product. Not only was I able to afford to keep her, I was able to quit my “day job” as a college professor, and devote myself to my horse business full time. We continued at Advanced in 2004, won the “Over the Walls” event and placed well at the Fair Hill CCI***. I retired her from eventing in 2005 at the age of 15, and she now has a successful show jumping career in the 4 foot divisions. Last month at age 17 she won a “Mini Prix” against horses half her age and many times her price. She now has two daughters by “Aberjack”, named “Dirtbike” and “Motocross”. They were foaled in 2004 out of surrogate mares following embryo transfer. They both went on “Stomach Soother” for nine days when they got ”foal scours”. I put them back on a month before they were weaned, and they have remained on it ever since. They both have their mother’s high strung, easily worried temperaments, but we have not had one episode of digestive distress, even though at 3 ½ they are now in training and trailering a few times a month. Gillian Clissold is an Advanced Level Eventer sponsored by Healthmate Products. Contact them at www.stomachsoother.com, or 800-584-8642. You can also order Stomach Soother from Holistic Horsekeeping in our online store.